Bacteria at hydrothermal vents inhabit almost everything: rocks, the seafloor, even the inside of animals like mussels. All are living under extreme pressure and temperature changes. Perhaps the oddest and toughest bacteria at vents are the heat-loving ‘thermophiles.’ Temperatures well above 662°F (350°C) are not uncommon at vents. The “world record” for life growing at high temperatures is 235°F (113¼C), a record held by a type of thermophile known as a hyperthermophile. These themophiles grow best above 176°F (80°C). Many thermophiles have a simple diet, based solely on the metals, gases and minerals that comprise the hydrothermal vent fluid. For example, on Knorr we are growing thermophiles collected from vent sites in the Indian Ocean that require only sulfur, hydrogen and carbon dioxide. The thermophiles we study today are modern relatives of ancient thermophiles. Think about what types of organisms might have lived more than 3.5 billion years ago. At first, Earth was a hot, volcanically-active planet. Slowly, over the years, it cooled and formed the lands and seas we know today. There are numerous theories that suggest thermophiles -- and life -- may have originated at deep-sea vents early in Earth’s history. But Earth is not the only place in our solar system where life could evolve and exist. All life as we know it requires water, an energy source and a carbon source. Both Mars and one of Jupiter’s moons, Europa, may have these conditions, and thus make good targets to look for past and present life. Can studying thermophiles at deep-sea vents help us in our search for evidence of past and present life on other planets? Scientists think the answer is yes. Clues on Mars’ landscape suggest that water once flowed there. Also, Mars still has an ice cap and there may be liquid water deep in the planet’s interior. There is also geologic evidence that Mars once had volcanoes, much larger and more powerful than the volcanoes we know today on Earth. Astrobiologists think that any evidence of life found on other planets will be bacteria-like, living beneath the planet or moon surface and using chemical energy for their life needs. Thermophiles are also useful to us on a daily basis. Thermophiles make protein molecules called enzymes that speed up chemical reactions. Enzymes from thermophiles are useful in high temperature situations. Enzymes are added to many washing detergents because they can “eat away” the oily stains on clothing in hot water. 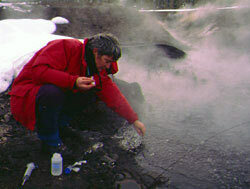 Genetic research is another area where thermophiles are used. The thermophilic DNA enzyme Taq polymerase, an enzyme that makes many copies of DNA pieces, was first obtained from the thermophile Thermus aquaticus from Yellowstone National Park. This thermophile creates the yellow-mustard color found in many hot springs around Yellowstone’s Lower Geyser Basin. Biotechnology companies have also been selling similar enzymes from deep-sea hydrothermal vent thermophiles. These enzymes are called Pfu polymerase and have helped us to discover genetic diseases, find criminals who may have left hair or blood at the crime scene and sequence the entire human genome. On this expedition, we use enzymes to try and identify the bacteria we collect from hydrothermal vents. Like detectives using genetic methods to find criminals, we look for a specific piece of genetic DNA that identifies our organisms, and then we make many copies of the gene. Using this process, we are finding many new types of bacteria at deep-sea vents that we have never seen before. It’s amazing to think what we might learn from them. This is a microscopic view of a bacterial community from a hot spring in the Azores, an island in the Atlantic Ocean. 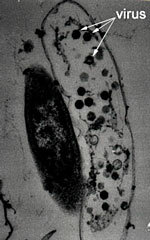 Notice all the sizes and shapes of the bacteria, yet none of them have names because none of them have been identified. Scale bar is 1 µm (1/1000 of a mm). Photograph: Paula Aguilar. This shows a cross-section view of a thermophile. Notice all the viruses in the cell. Viruses are much smaller than bacteria and are abundant at deep-sea vents. Photograph: Terry Beveridge. 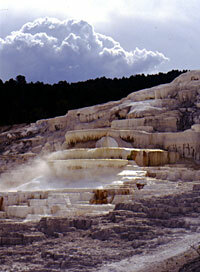 Thermophiles may assist in creating terraced rock structures like these, located at Mammoth Hot Springs, Yellowstone National Park, USA. Astrobiologists are interested in how these rocks because it gives them insights into how rocks may form on other planets.